Two trams which roll through the narrow streets of Soller, down narrow passages and past (also through) restaurants between the town of Soller and Port de Soller, have been carefully and lovingly restored. The trams restored were two of the open carriage trams, this involved the replacement of almost all the wood whilst in the workshops near Soller; it is now possible to visualise them as they would have appeared when originally pulled through the streets by horses in the late 1800's. Anyone visiting Mallorca would find a days visit to Soller very worthwhile. If starting from Palma you can drive there either over the very steep and winding hill road, or through the much quicker direct tunnel; or you can catch the Soller Train from Palma which travels up the valley then through a long mountain tunnel emerging to spectacular views above the town, there is a short stop at a view-point before looping around on itself during its descent down into the town. 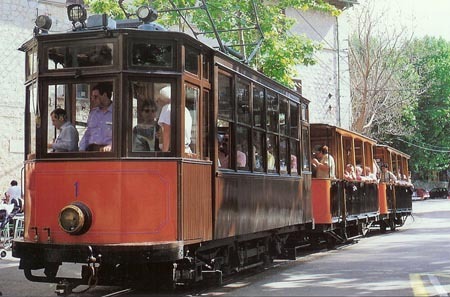 Once reaching the terminus station in Soller, the journey can be continued through the town on the tram, this takes you the final distance to the Port of Soller.